The most prestigious of the Nobel science prizes is the award for physics. This is partly due to the coincidence of the establishment of the prize and a revolution in the field of physics during the first third of the twentieth century, when Albert Einstein advanced his theory of relativity and quantum mechanics was born. Einstein’s theory transformed our ideas of space and time, extending classical physics to the realm of high velocities and astronomical distances. Quantum mechanics, on the other hand, was developed over several decades by many people and is an extension of physics to subatomic, atomic, and molecular sizes and distances. Relativity theory and quantum theory are essential elements of what is now called modern physics. The Hoover Archives holds private correspondence of several theoretical physicists—Einstein, Niels Bohr, Werner Heisenberg, Erwin Schrödinger, and Max Born—whose work helped lead to technological breakthroughs in the instruments of war, thus influencing the shape of international relations and the world order in the second half of the twentieth century. These letters illuminate the contrasting, sometimes clashing, mix of personalities that makes possible the leaps of scientific progress. From its birth in the sands of New Mexico, the atomic age they helped create is now sixty-five years old. Werner Heisenberg’s breakthrough marked the beginning of the end of the quantum revolution begun by Max Planck in 1900. In 1913, the Danish physicist Niels Bohr was the first to propose a theory of the atom based on quantum principles. Bohr’s model, in which electrons orbit a nucleus in the manner of a solar system, was a kind of hybrid, combining elements of quantum and classical physics without really resolving the wave-particle duality. Bohr’s model would win him the 1922 Nobel Prize, but its limitations inspired the search for a purely quantum physics. A key figure in this investigation was Werner Heisenberg. Heisenberg received his doctorate from the University of Munich in 1923, then worked for a year under Max Born at Göttingen and for three years under Bohr in Copenhagen before becoming professor of theoretical physics at the University of Leipzig in 1927. In 1925, Heisenberg presented a scientific paper whose findings marked an extraordinary breakthrough. His insight was to regard quantum phenomena as fundamentally different from those of classical physics and not adequately represented by mechanical models of orbiting electrons. Heisenberg replaced the unobserved orbits of Bohr’s atomic model with a series of mathematical entities representing observed quantities, such as the radiation emitted or absorbed by an atom. 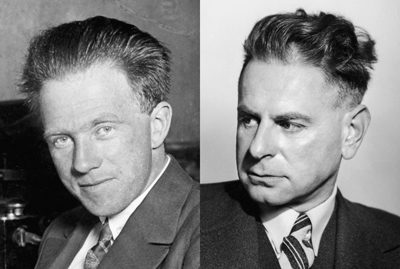 Physicist Werner Heisenberg, left, was challenged by the philosopher Karl Popper, right, to defend his paradoxical uncertainty principle. Heisenberg’s explanation left Popper unsatisfied until Albert Einstein intervened to steer Popper away from physics and back to his strong suit, scientific logic. Heisenberg’s breakthrough marked the beginning of the end of the quantum revolution begun by Planck in 1900. But there was still work to do to complete the transition from mechanical models of the atom to observable quantities measured in the laboratory as the basis for a quantum mechanics. As part of this effort, in the beginning of 1927 Heisenberg put forward the uncertainty principle, with which his name will forever be linked. Heisenberg’s uncertainty principle states that the position and momentum of a particle cannot both be exactly known at the same time (momentum is mass times velocity). The more precisely the position is determined, the more indeterminate is the momentum, and vice versa. This uncertainty is not due to poor measurement or inadequate measuring instruments, but rather is a fundamental property of the very act of measurement: the unavoidable interaction between the thing observed and the observing instrument. The accuracy of calculating the future position and momentum of a particle is limited to a range of possibilities. The Heisenberg uncertainty principle is a fundamental principle of nature, and applies to the calculations of other conjugate pairs of variables, such as energy and time. Heisenberg established indeterminacy as a basic quantum principle, in accordance with the Copenhagen interpretation—so named because Bohr, who refined the concept, was based in Copenhagen. But the year after Heisenberg won his Nobel, his theory came under attack from an unexpected quarter: the Austrian philosopher Karl Popper, whose breakthrough book on the philosophy of science, Logik der Forschung (The Logic of Scientific Discovery) was just about to appear in Vienna. Popper (who later became a Hoover senior research fellow and whose papers also reside in the Hoover Archives) regarded the indeterminacy of Heisenberg’s theory, which seemed to deny the existence of a reality separate from the observer, as a threat to his own theory of science, so he set about trying to disprove it. Early in the summer of 1934, Popper designed an imaginary experiment measuring an electron’s momentum and position simultaneously. (Because contemporary physicists lacked the means to test single particles, quantum theorists commonly used thought experiments.) Popper believed his experiment demonstrated that, contrary to Heisenberg, both a particle’s position and its momentum could be precisely ascertained at the same time. He erred in assuming that in an experiment where the measurement of momentum preceded the measurement of position, a scientist could reconstruct an electron’s position prior to the measurement of its momentum. In fact, this was not possible. Popper’s testy correspondence with Heisenberg and one of Heisenberg’s colleagues in Leipzig during the winter of 1934–35 taught the philosopher, eventually, that he was out of his intellectual depth in the field of physics. In a 1934 letter housed at Hoover, Heisenberg begins by apologizing that Popper had found the criticism delivered by Heisenberg’s colleague Carl von Weizsäcker so sharp (the very fact that Heisenberg had delegated such correspondence to a junior colleague probably rankled Popper as much as anything). Then Heisenberg patiently, and perhaps a bit patronizingly, demonstrates to Popper the mistake in his thought experiment. 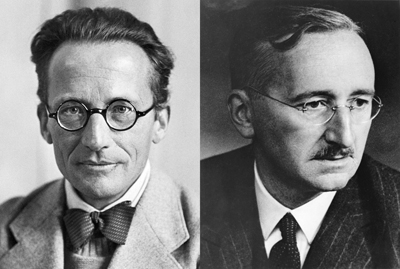 The Austrian physicist Erwin Schrödinger won the 1933 Nobel Prize, sharing the award with Paul Dirac. Schrödinger was the author of wave mechanics, a contender to matrix mechanics as the new quantum mechanics. His discovery built on the work of physicists going back over a century, when it was first assumed that light was a continuous wave. This theory received support in the 1870s from James Clerk Maxwell’s equations showing that light was a form of electromagnetic wave. The wave theory of light was challenged by Einstein in 1905, the same year he proposed the theory of relativity. Following Planck’s lead, Einstein proposed the idea that light consisted of discrete packets, light quanta (now called photons). “I really fear that you have fallen victim here to one of those obvious errors of the kind Bohr and I had to work through back in 1927 before we could really believe we had understood quantum theory,” Heisenberg wrote to Popper, perhaps a bit patronizingly. Two decades later, a French doctoral candidate, Louis de Broglie, argued that if electromagnetic waves could behave under certain conditions like particles, as Einstein had demonstrated, then particles must have wavelike properties. De Broglie’s hypothesis on matter waves, endorsed and elaborated on by Einstein, inspired Schrödinger to apply the wave description of particles to a quantum theory that transcended Bohr’s limited atomic model. A 1926 experiment led him to formulate a mathematical equation that described quantum phenomena in terms of waves. The Schrödinger equation immediately became the core of a new quantum wave mechanics that rivaled the matrix mechanics of Heisenberg. Quite suddenly, after the long search for a quantum mechanics, there existed two competing and seemingly antithetical versions. Yet in May 1926, only two months after publishing his equation, Schrödinger surprised everyone by demonstrating that matrix mechanics and wave mechanics were mathematically equivalent. A sharp debate ensued between the proponents of matrix and wave mechanics, with more physicists preferring Schrödinger’s more easily visualizeable waves to Heisenberg’s purely mathematical matrix. Heisenberg’s formulation of uncertainty in March 1927 seemed to settle the debate in favor of the matrix, but Bohr came forward with an interpretation that encompassed both approaches. Bohr’s complementarity principle, as summarized by historian Cassidy, determined that “wave physics and particle physics were not, as hitherto supposed and debated, antithetical—either wholly right or wholly wrong—they were complementary—mutually exclusive yet jointly essential. Rather than explaining away the wave-particle duality in favor of one or the other extreme, Bohr incorporated it into the very interpretation of quantum mechanics.” Thus were laid the foundations of the so-called Copenhagen interpretation of quantum mechanics. A rare color image, taken by a 16 mm movie camera aboard a B-29 dubbed The Great Artiste, shows the first atomic weapon exploding over Hiroshima on August 6, 1945. This film was donated to the Hoover Archives by Harold Agnew, a physicist who monitored the blast from the air with scientific instruments. The awarding of three Nobel physics prizes in the same year, 1933 (Heisenberg’s given for the previous year), created the impression that some kind of harmony reigned in the field of physics, but in fact it was torn by a schism. Schrödinger, along with Einstein and de Broglie, opposed the Copenhagen interpretation of quantum mechanics, troubled by its indeterminacy. In the debate, Einstein was keen to insist that an objective physical reality existed independently of the physicist; Bohr maintained that for all practical purposes this hardly mattered, because every observation made by a physicist compromised the independence of the observed phenomenon. Uncertainty ruled. Schrödinger continued to search for a description of quantum phenomena in terms of waves alone. He failed, however, and the Copenhagen interpretation became, as it remains, the dominant view. The awarding of three Nobel physics prizes in the same year created the impression that some kind of harmony reigned in the field of physics. In fact, it was torn by a schism. In 1927, the year after he discovered his great equation, Schrödinger succeeded Planck in the chair of theoretical physics at the University of Berlin. When the Nazis came to power in 1933, Schrödinger resigned his position and moved to Oxford for a short time before returning to Austria in 1936. After the German Anschluss with Austria in 1938, he lost his professorship at the University of Graz and fled to Italy. Concerned scientists helped him go to Dublin, Ireland, where he became the first director of the School of Theoretical Physics at the Institute for Advanced Studies. Heisenberg’s career, meanwhile, thrived inside Nazi Germany, though he never joined the National Socialist Party. In 1941 he was appointed professor at the University of Berlin and director of the Kaiser Wilhelm Institute for Physics. During the war he headed Germany’s atomic bomb project, which led to his split with his teacher and colleague Niels Bohr after their meeting in German-occupied Copenhagen in 1942, under circumstances that remain famously uncertain. Two distinguished Austrian exiles discovered toward the end of the Second World War that they had been acquainted through family connections during their childhood days in Vienna. Friedrich von Hayek, an economist at the London School of Economics, had the year before published a bestselling book, The Road to Serfdom. Schrödinger had published a little book of his own in 1943, What Is Life? 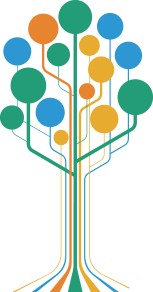 The Physical Aspects of a Living Cell, based on a celebrated series of three public lectures he gave in Dublin in which, in an attempt to apply physics to biology, he proposed a molecular approach to the study of genes. Schrödinger’s book is credited with inspiring James Watson and Francis Crick, the discoverers of DNA, to enter the field of molecular biology. Schrödinger’s book was not nearly as popular as Hayek’s Road to Serfdom. In a 1945 letter to Hayek (whose collected papers also reside in the Hoover Archives), the physicist laments that the public tended to think of scientists like himself as nothing more than narrow specialists, unqualified to address larger issues beyond their area of expertise: “You are a little better off, because your subject has very much more to do with the practical future of the world than mine has.” Seven months after Schrödinger wrote these lines, on July 16, 1945, the first atomic bomb was exploded, at the Trinity Site in New Mexico. 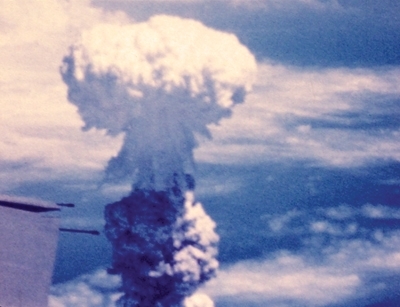 Three weeks later, an atomic bomb was dropped on Hiroshima. Available from the Hoover Press is War, Revolution, and Peace in Russia: The Passages of Frank Golder, 1914–1927, edited by Terrence Emmons and Bertrand M. Patenaude. To order, call 800.935.2882 or visit www.hooverpress.org.